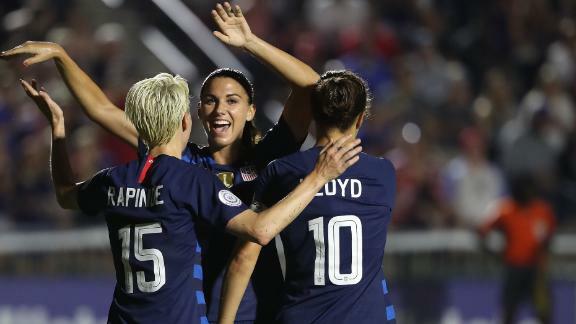 Carli Lloyd's hat trick helped a heavily rotated United States squad top Panama in another World Cup qualifying rout. 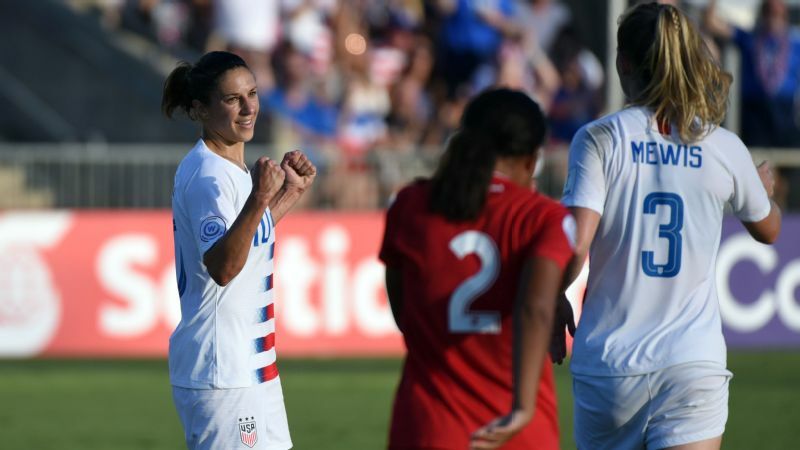 CARY, N.C. -- The U.S. women's national team faced its oldest rival on Sunday, an opponent that for decades has drawn the best out of fierce, frequent encounters around the globe. Panama was the opponent on the scoreboard, but the biggest competition the Americans in the starting lineup faced was the teammates on their own bench. That is always the case. To compete for World Cup titles, U.S. players first compete against one another. 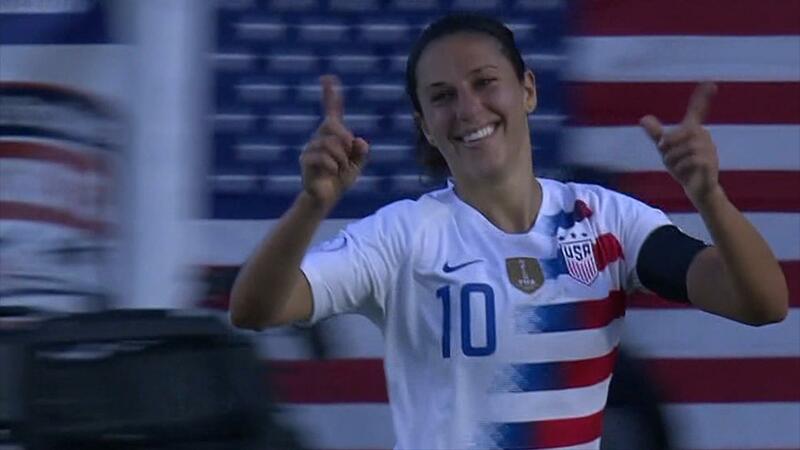 With as much of the starting lineup as mathematically possible from an opening rout of Mexico looking on from the sideline, the U.S. women beat overmatched Panama 5-0, with a hat trick from Carli Lloyd, to remain unbeaten in the CONCACAF Women's Championship. 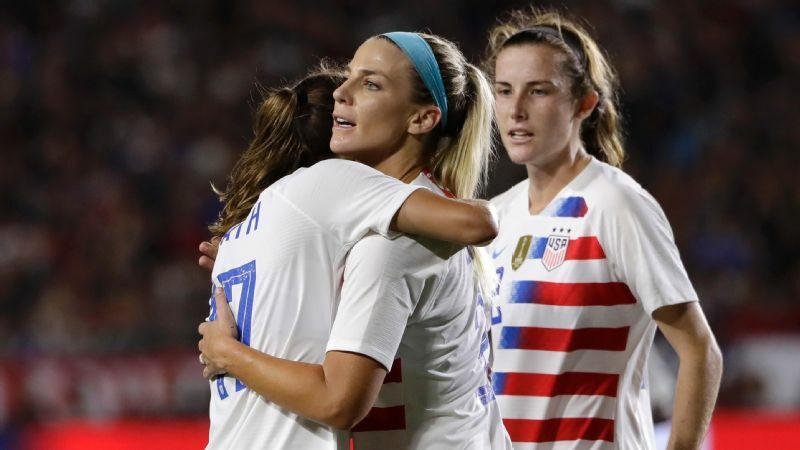 The result clinched a place in the semifinals next week and all but assured World Cup qualification (the United States would need to lose a semifinal, the third-place game and a home-and-home playoff against Argentina to miss the World Cup). U.S. coach Jill Ellis made nine lineup changes from the opening game, deploying every player who didn't start against Mexico and giving repeat starts only to Abby Dahlkemper and Julie Ertz. It was, she said, a nod toward playing five games in 13 days, including three in North Carolina in what has been and is forecasted to remain sweltering humidity for early fall. It was, she said, an attempt to manage a couple of undisclosed, minor injuries among the starters from the Mexico game. It was all planned. "I'm just really pleased with the amount of depth we have," Ellis said. "And feel like players came in and were contributing as we thought they should. It wasn't about chopping and changing." Carli Lloyd has 105 goals in 261 caps. Sunday marked her eighth career hat trick and first since September 2016. To make nine changes at once, rather than mixing and matching lineups over the final two games of group play against similarly overmatched opponents, was to send a message that there is a depth chart at the moment. This was the second line. The group that started against Mexico also started, with few alterations, throughout the recent Tournament of Nations. But to turn all nine of these players loose at the same time was also to reinforce the message that no depth chart is permanent on this team. Its identity is found in the constant competition for minutes that makes training sessions the equal of many games, even World Cup qualifiers. "This group is so talented and so deep that we are sometimes our own best competition," Sam Mewis said. "We always say that our intra-squad games, it's, like, impossible to play because you're just faced up against someone who is literally doing the same role as you, and it's really, really challenging. "I think that's why we are continuing to grow and get better every day is because we are challenged so much in training every day. That's one of our best weapons." Mewis earned and delivered the first goal inside of five minutes. After absorbing a foul 20 yards from goal and then seeing her free kick tipped over the crossbar by Panamanian goalkeeper Yenith Bailey, foreshadowing a busy and gutsy night on her part, Mewis rose above a disorganized defense and headed home the corner kick from Christen Press. Mewis was one of the team's best and most available players in 2017. She played the second-most minutes and demonstrated the ability to play all over midfield. 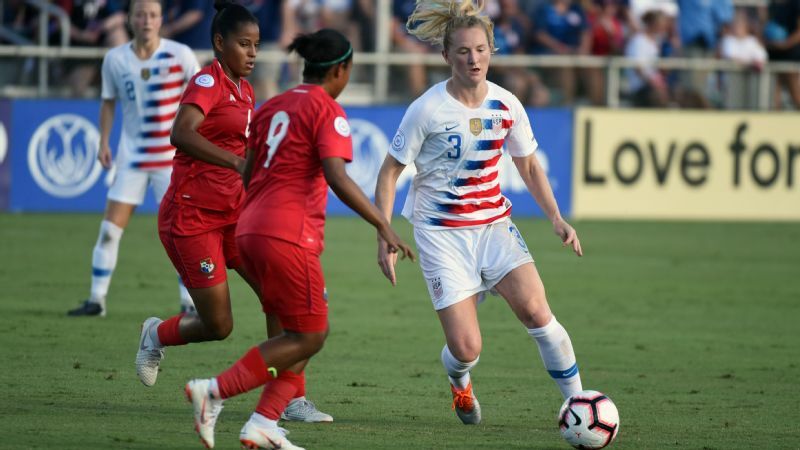 But between her injury issues earlier this year and Rose Lavelle's return from injury, Mewis started Sunday for the national team for just the second time in 2018. In flicking a beautiful pass or two and controlling real estate, she looked like someone not ceding anything for 2019. Sam Mewis opened the scoring in the fifth minute Sunday, netting her eighth international goal. Yes, the U.S. field management had roster maintenance and tactical experimentation in mind. The U.S. women opened the game with a tactical tweak from their standard 4-3-3, instead playing about the first 10 minutes with three defenders and first-time starter Hailie Mace pushed forward alongside Lloyd as an extra striker (they finished the game the same way, with second-half substitute Lindsey Horan playing alongside Lloyd). It was a way to test under game conditions a formation that could be used to chase a goal late in games down the road (such as the one the United States was unable to find in a 2016 Olympic quarterfinal against Sweden that went to penalty kicks). But the players on the field didn't look content as placeholders or pawns. Look at Lloyd's night, which included her eighth international hat trick. She scored with her head off both a corner kick and a free kick and with her feet on a nifty move in open play. "She's a goal scorer," Ellis said. "She's got so much value to her, but that's ultimately what she gives us is the ability to score goals. And to see her get a hat trick was great and potentially some more in terms of the chances we created." Starting and playing the full 90 minutes as the No. 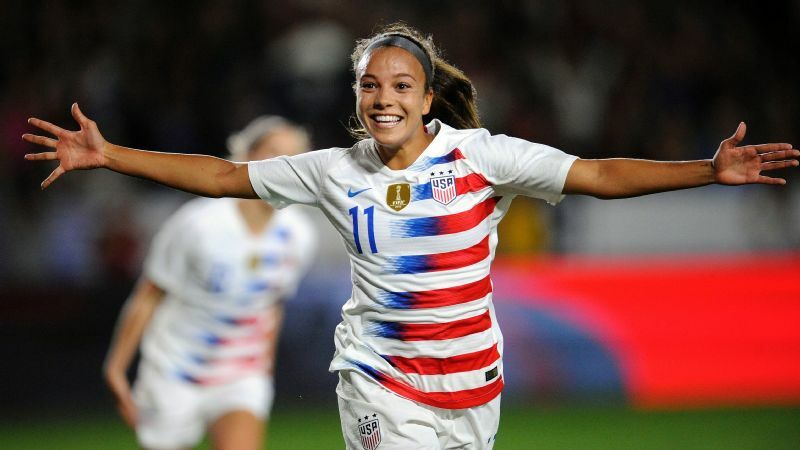 9, the forward in the middle of the attack -- at times alone Sunday as the United States also experimented with more of a 4-5-1 shape -- she looked less like a converted midfielder than a darn good striker. Lloyd in that role doesn't look like an attempt to shoehorn in a veteran whom it would be awkward to phase out. It looks like the United States found the world-class player it needed for depth at center forward. She is still excellent in the air, still knows where the goal is at all times, still makes the runs to find open space in the box. An attempted chip from short range in the second half that found the crossbar was cheeky, so much so that it drew a rather frustrated reaction from Ellis, but it was also the mark of a player embracing a new identity. She wants to be unpredictable as a No. 9. She wants to be the best, and she's willing to work at it. "Obviously, with age you've got to change some things," Lloyd said. "I still feel probably as fit as I've ever felt, as explosive as I've ever felt. But these last couple of years, I've really been kind of trying to train my brain in a different way. 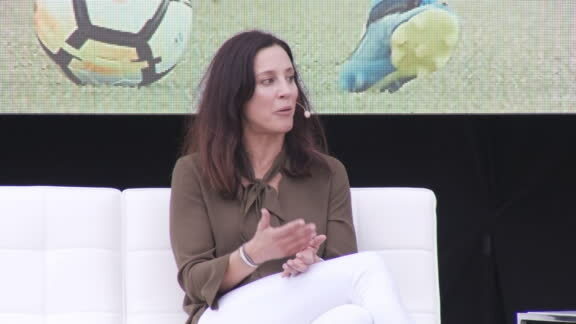 I'm not the Carli Lloyd five years ago that's just going to get the ball and just start running toward goal. "I've got to be able to play smarter with my brain, so these last couple of years for me, personally, have been studying the game and trying to evolve. With that, it's kind of been this thing where I've maybe had to take a couple of steps backward to go five steps forward." When you get that from players with 105 goals, you get competition up and down the roster. Sure, the U.S. women, Lloyd included, were profligate in front of goal. 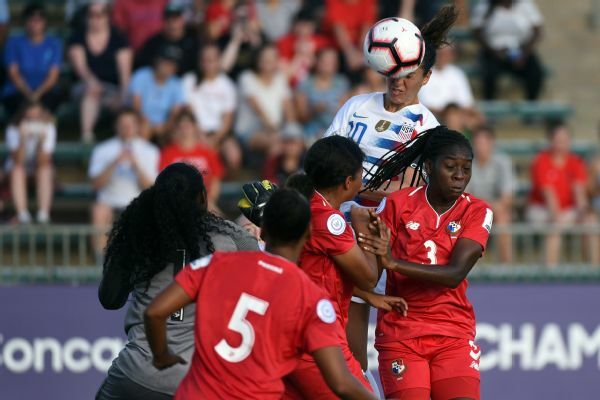 While Bailey literally had a hand in matters and Panama as a whole showed resolve in the second half, the final goal tally could easily have reached double digits. As Ellis noted, that conversion rate is a lingering issue. It's not what the United States did to Panama that really matters. What matters is how much of a glimpse we got of the kind of competition that takes place every day in training. "It should give the group a lot of confidence knowing that we've got so much depth to this team," Lloyd said. "We can seriously be deadly and unstoppable. It's coming together collectively for everyone."